Every year as well as attracting Hollywood royalty the Cannes Film Festival also draws some of the world’s largest yachts to the French Riviera. Find out which superyachts were spotted at the 2016 Cannes Film Festival. 1. Ulysses, Octopus and Savannah One yacht making her debut at this year's Cannes Film Festival was recently delivered Ulysses. She was spotted in the French Riviera for the first time on May 15. The 107 metre explorer yacht was in good company as she was pictured alongside 83.5 metre Savannah and 126.19 metre Octopus. Savannah was named Motor Yacht of the Year at the World Superyacht Awards in Florence. The elegant Feadship was also a multiple winner at the ShowBoats Design Awards earlier this year. Every year as well as attracting Hollywood royalty the Cannes Film Festival also draws some of the world’s largest yachts to the French Riviera. Find out which superyachts were spotted at the 2016 Cannes Film Festival. 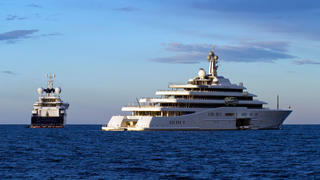 One yacht making her debut at this year's Cannes Film Festival was recently delivered Ulysses. She was spotted in the French Riviera for the first time on May 15. The 107 metre explorer yacht was in good company as she was pictured alongside 83.5 metre Savannah and 126.19 metre Octopus. 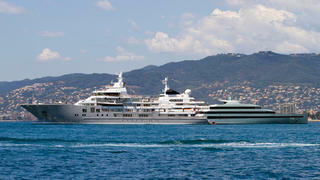 Savannah was named Motor Yacht of the Year at the World Superyacht Awards in Florence. The elegant Feadship was also a multiple winner at the ShowBoats Design Awards earlier this year. Bad weather meant that some yachts delayed their arrival at the Cannes Film Festival. 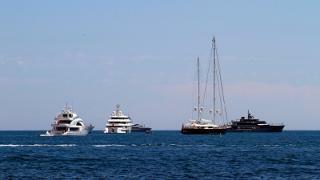 However, as the week continued more impressive superyachts were spotted. 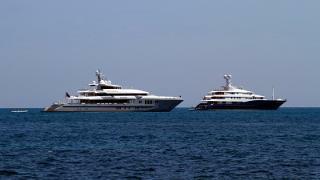 This picture shows 45 metre Fathom, 68.49 metre Lady S, 77 metre Silver Fast, 52.27 metre Luna and 54.8 metre Atlante moored behind the Lérins Islands. The 78.43 metre C2 and 73.51 metre Mogambo were also spotted behind the Lérins Islands during the 2016 Cannes Film Festival. Delivered in 2012 Mogambo is considered to be one of the best luxury yachts for charter in West Mediterranean this summer. 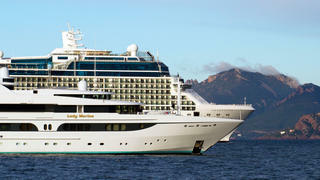 C2 is also no stranger to having guests on board and has proved popular with celebrities. Harry Styles and Kendall Jenner were spotted on board in St Barts this holiday season. The 78.43 metre C2 and 73.51 metre Mogambo were also spotted behind the Lérins Islands during the 2016 Cannes Film Festival. Delivered in 2012 Mogambo is considered to be one of the best luxury yachts for charter in West Mediterranean this summer. C2 is also no stranger to having guests on board and has proved popular with celebrities. Harry Styles and Kendall Jenner were spotted on board in St Barts this holiday season. 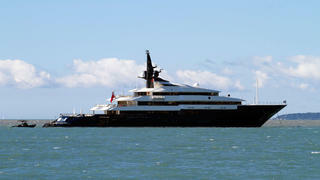 Steven Spielberg’s Seven Seas was pictured alongside 58.09 metre Taouey and 52 metre Seahorse. 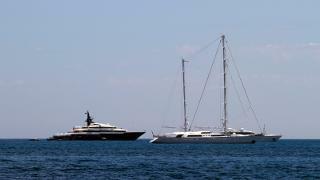 The 73.3 metre _Odessa II _was also spotted in Cannes during the Festival. She is pictured here anchored off the Croisette of Cannes. Odessa II is the perfect party yacht as she is equipped with DJ equipment for sun deck parties, a beauty treatment room and a beach spa to help guests recover the next day. Odessa II is available to charter at a weekly rate of €750,000 but it is not clear if she was chartered for the Cannes Film Festival or whether her owner was on board. The 73.3 metre _Odessa II _was also spotted in Cannes during the Festival. She is pictured here anchored off the Croisette of Cannes. Odessa II is the perfect party yacht as she is equipped with DJ equipment for sun deck parties, a beauty treatment room and a beach spa to help guests recover the next day. Odessa II is available to charter at a weekly rate of €750,000 but it is not clear if she was chartered for the Cannes Film Festival or whether her owner was on board. Two giants of the superyacht world, Octopus and Eclipse, were spotted next to each other anchored off the Eden Roc hotel at Cap d'Antibes. Eden Roc is one of the best hotels in the world to visit by superyacht and de Grisogono hosted its annual party at the stunning location during the festival. The world’s largest explorer yacht Octopus is owned by Microsoft’s Paul Allen and has just returned from a winter cruising in the Maldives. Paul Allen hosted an "Enchanted Garden" party on board for more than 200 guests during the Cannes Film Festival 2016. Two giants of the superyacht world, Octopus and Eclipse, were spotted next to each other anchored off the Eden Roc hotel at Cap d'Antibes. Eden Roc is one of the best hotels in the world to visit by superyacht and de Grisogono hosted its annual party at the stunning location during the festival. The world’s largest explorer yachtOctopus is owned by Microsoft’s Paul Allen and has just returned from a winter cruising in the Maldives. Paul Allen hosted an "Enchanted Garden" party on board for more than 200 guests during the Cannes Film Festival 2016. 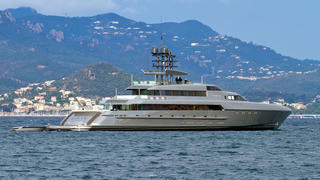 It is perhaps no surprise that Steven Spielberg’s Seven Seas was one of the first yachts spotted heading towards Cannes. The 86 metre yacht was pictured anchored near Nice airport waiting to pick up guests. Steven Spielberg’s adaptation of Roald Dahl’s BFG was shown during the festival before its release in July. Recently back in Mediterranean, Silver Fast was another early arrival and was pictured moored off Cannes. The super-fast 77m superyacht was delivered last year. Designed by Espen Oeino she is the world's largest and fastest aluminium yacht and is capable of speeds in excess of 27 knots. At 63.95 metres Feadship Lady Marina is not used to being dwarfed but she was when she was passed by a large cruise ship while anchored off Cannes during the Festival. 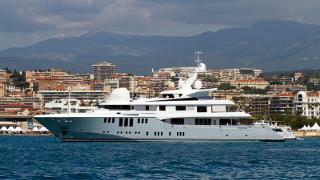 Delivered to her owner in 1999 she is regularly spotted in the French Riviera. She has a helideck enabling guests a smooth arrival at the festival. At 63.95 metres FeadshipLady Marina is not used to being dwarfed but she was when she was passed by a large cruise ship while anchored off Cannes during the Festival. Delivered to her owner in 1999 she is regularly spotted in the French Riviera. She has a helideck enabling guests a smooth arrival at the festival.